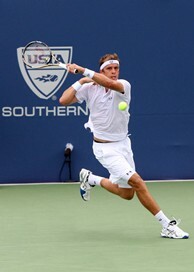 The hottest player on tour will face a crafty left handed veteran searching for his first ATP World Tour title tomorrow when U.S. Olympian Andy Roddick meets Luxembourg Olympian Gilles Muller in the 3 p.m. Sunday singles final at the BB&T Atlanta Open being played at Atlantic Station. Roddick, who has won 10 of his last 11 matches, has won the last three meetings between the pair (in 2006, 2008 and earlier this year). His only loss to Muller, a former US Open junior champ, came in the first round of the 205 US Open. "That was seven years ago," Roddick responded when a reporter asked him about the 2005 loss. "I’m going to have to put a lot of returns in play against him. He will probably try and come to the net more often than John (Isner). And his serve will be coming from a different angle." 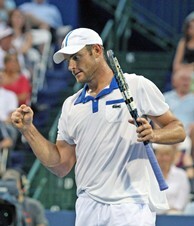 Roddick recently won his 31st career tour title in June when he captured the AEGON International in Eastbourne. "Winning is contagious," he said of his hot streak. "And sometimes so is losing. It’s been a nice tournament for me so far. I’m excited. I went through a real bad stretch there and now I have a chance to win my second tournament in three tournaments." Roddick broke onto the world scene way back in 2001 as a 19-year-old winning his first pro title in Atlanta. "That was a long time ago," he said. "It was a different surface, a different time of year so not a lot of parallels there." Sunday’s singles winner will hoist the winning trophy and stand in the line at the bank to cash the $86,270 check with his name on it. The runner-up will get $45,435 and 150 ranking points. Roddick has played each of his three matches under the lights so he said the conditions will be different and the balls "a lot more lively." Muller, who is 0-2 in career finals, said he wouldn’t watch the evening semi but instead would have dinner and head back to his room to relax. "I’ll check in with who I play but I won’t watch the match," he said. "It doesn’t matter who I play I’m just glad to be in the final," he continued. "Either way it’s going to be a good player. I don’t have a game plan for one or the other. They are both good servers so it’s going to be the same match." Muller sat out seven months with a knee injury and told the press that it might have been the best thing that happened to him. "I’m just trying to enjoy every second but I know at any moment it can be gone. I’m just trying to make the most out of it."